9 Comments to "IQ Is A Social Construct Except When It Isn't"
I think the criminal justice system is a kind of crowd control to keep the peace for society. While reducing crime is one of the agenda, there are other forces at work. In any other country, the retarded will get a better shake compared to the cognitively normal. I think the society realize that these people somehow get the short end of the stick (in their upbringing, genetic lottery) and is offering them preferential treatment in sympathy. That might be true in places like China where a kind of social Darwinism prevails, perhaps even in California, but in places like Texas it is more a kind of Calvinist “eye for an eye” attitude where the morally righteous avenge a sin in the eyes of the lord (note Texas has a Department of Criminal Justice not a Department of Corrections). The anti-DP argument in Texas is an attempt to place a Corrections attitude over a Divine Justice attitude, which I think will surely fail. I wouldn’t think that people who are diagnosed as mentally retarded commit much crime. For one thing, they often have family members or others looking out for their well-being and, in the process, keeping them out of trouble. Mentally retarded people also tend to be socially isolated and therefore less likely to be exposed to bad influences. My guess is that the danger zone in terms of I.Q. and criminality is in the subnormal but not retarded range, say 80 to 90. The chart proves two points. Dumb people commit more crime. Dumb people are more likely to get caught for their crimes. At least some eugenic effect here. As ironrailsironweights mentioned earlier, the majority of mentally retarded people don’t commit crime but they and mentally ill people may be over-represented in the prison population. Mentally retarded people commit dumb crimes that leave an easy trail for police to follow and they’re more likely to confess to crimes they committed (and to ones they didn’t commit). They’re also less likely to be paroled and to have capable lawyers who can defend them and prove their innocence or get their crime reduced from, say, murder to manslaughter. It’s possible that being mentally subnormal attracts the attention of smarter crooks who figure that they can get the mentally retarded person to commit a crime on their behalf or take the rap for a robbery or murder while they get away with the proceeds or plead innocence. An example might be the drug dealer who gets a mentally subnormal kid to be a drug mule so police track the kid instead of the dealer. There was that incident years ago when some Israeli soldiers persuaded a 13 year old Palestinian kid who was mentally retarded to wear a bomb pack and that was when it dawned on people that many Palestinian suicide bombers were being set up by the IDF. If it’s easy for smart crooks to persuade a subnormal person to commit crime, by the same token it should be easy to rehabilitate the subnormal person by teaching him/her basic survival and job skills to a level where the person could live semi-independently and ensurimg that person stays away from the environment in which s/he became involved in crime eg getting the person to work for a church or charity and live in a hostel under supervision. Any income the person earns would maintain his/her upkeep and any left over could go towards helping the crime victim/s and their families. The charity would teach the subnormal person basic ethics like “stealing is wrong, murder is wrong” and provide role models to model ideal behaviour for the subnormal person to follow. Last time I looked at the financial cost of capital punishment in the US was several years ago and already in the late 1990s – early 2000s, the cost of executing someone was US$8 million in Florida. I think I might have seen that figure in Robert Ressler’s book on serial killers “Whoever fights Monsters”. There are costs involved like the various appeals processes which take up people’s time and hiring and paying juries for several trials that might take weeks or months. Economic austerity may be the one thing that gets cash-strapped states like California to abolish the death penalty. 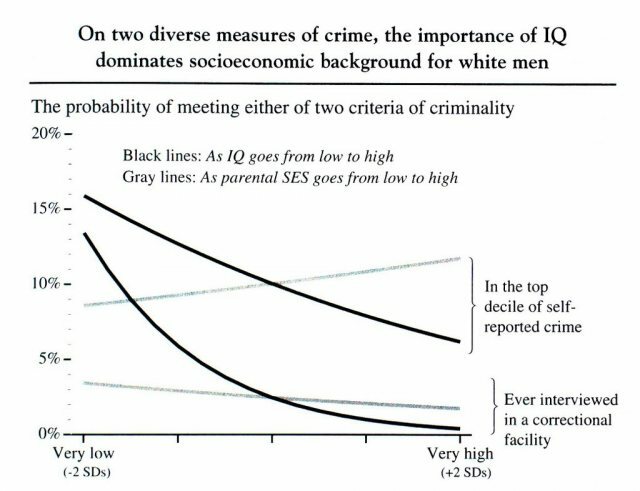 I’m pretty sure the relationship between IQ and crime is curvilinear with non violent criminals averaging somewhere around 92 and violent criminals averaging around 80. There comes a point where some people are too stupid to think up a crime. I believe that you are going too far in one respect: in the case in question, the petition was for the sentence to be commuted from death to life in prison. This does not, as you put it, put the mentally retarded “above the law”. It instead recognizes an ancient concept, embraced in Judeo-Christian ethics, that culpability should be commensurate with the ability to formulate malevolent intent. In this case, the defendant did indeed demonstrate malevolent intent, but his lawyers argued that his mental deficiencies lowered the degree of ethical awareness required for the most extreme punishment under the law. Since I am not familiar with the details of this case, I have drawn no conclusions regarding its outcome, but I can state with confidence that your own analysis is deeply flawed by the standards of American law and Judeo-Christian ethics. Lastly, I would suggest that the analysis of subtle legal issues should be founded on a thorough understanding of our legal traditions in preference to any political preferences.